Simcenter Amesim allows system simulation engineers to virtually assess and optimize the performance of mechatronic systems. This will boost overall systems engineering productivity from the early development stages until the final performance validation and controls calibration. Simcenter Amesim includes ready-to-use multi-physics libraries combined with application and industry-oriented solutions that are supported by powerful platform capabilities, to let you rapidly create models and accurately perform analysis. Simcenter Amesim software provides an advanced and easy-to-use environment for 1D multi-domain system simulation and robust design. The physically conservative multi-port modeling of physical components as well as a block diagram approach for control systems enables the coupling of all libraries within a built-in and comprehensive workflow. Open and flexible, the Simcenter Amesim efficiently interfaces with many 1D and 3D CAE software solutions and helps you quickly derive and export models for standard real-time targets by providing a consistent and continuous model-in-the-loop (MiL), software-in-the-loop (SiL) and hardware-in-the-loop (HiL) capable framework. Model, simulate and analyze mechatronic systems in a user-friendly, scalable and intuitive graphical interface. Simcenter Amesim Platform facilities offer unique usability with a variety of user-friendly features. With super components, you can consolidate a group of components to create subsystems. This feature adapts to complex systems in which topological subsets can be identified. The Simcenter Amesim interactive help contains full HTML documentation for every submodel, utility and demonstration. Watch this video by Siemens PLM Software to learn more about how AMESim helps to analyze and design optimal transmission systems in the Automotive industry. Simcenter Amesim analysis tools help explain system behaviour and highlight dynamics so you can adapt the required level of modeling to get the best accuracy in time and frequency domains. Examples of system analysis tools include fast Fourier transform (FFT), spectral map, linear analysis order tracking and activity index. Simcenter Amesim provides a comprehensive set of methods, representations or animation capabilities that helps analyze your system. Based on the most advanced numerical integrators, the Simcenter Amesim integration algorithms support ordinary differential equations (ODE) and differential algebraic equations (DAE). The Simcenter Amesim solvers automatically and dynamically select the best adapted calculation method – depending on the dynamics of the system. The performance analyzer provides you with a comprehensive and easy-to-use set of graphical utilities along with parallel processing and discrete partitioning facilities to reduce computation times on very large systems. Watch this Siemens PLM Software video showing how performance analysis during impact testing can be achieved. Design of controlled systems requires the integration of the mechanical and controls systems during the simulation phase to efficiently ensure proper results. This integration is done at different steps of the process – first with model-in-the-loop (MiL) or software-in-the-loop (SiL) and then in hardware-in-the-loop (HiL). The integration of plant models with a control model or code ensures the required accuracy as well as accessibility of the variables needed for controls. With Simcenter Amesim you get a unique integrated platform that provides realistic component and system models for every stage of the development cycle, enabling both system engineers and control engineers to start evaluation and validation phases early in the design cycle. Early evaluation and validation helps eliminate development cycle uncertainty resulting from late design process integration. 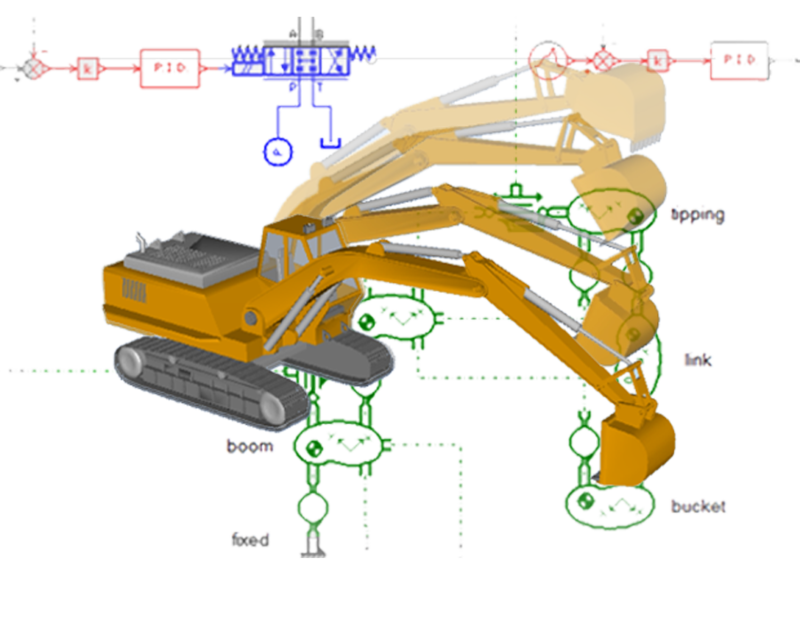 Watch this Siemens PLM Software video showing the optimization of an excavator model for real-time usage.